It’s almost that time of the year again. You might still be lamenting the end of the summer/fresh salmon season. You might also be stocking up on our flash frozen fillets. Either way, you should GET EXCITED about our upcoming local fall fishing. We will be heading out in just a couple weeks to fish for Keta salmon in Puget Sound, and we are here now to answer all your questions and get you pumped about fresh Keta! Keta salmon, also known as chum, are the second most abundant and second largest (next to King) species of pacific salmon, averaging 10-15 pounds. They spend a short amount of time as fry in the estuaries before heading out to the ocean to mature. They have an average life span of 3 to 6 years. Huge Keta from last year’s fall season! Oh, Chum salmon… right. Isn’t that what people feed their dogs? 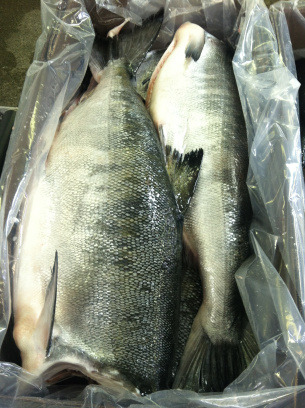 So here’s the truth about Keta salmon: Keta have gotten a bad rap over the years. Why? One reason is the negative association their name draws to the idea of “chumming the water” (luring other fish with smaller fish, guts, etc). Another reason for this reputation is that keta eat lower on the food chain, which causes their flesh to turn pale and break down as they enter fresh water environments to spawn. However, when caught in saltwater, and cleaned and handled properly (as we so pride ourselves in doing at Loki), the keta salmon have a firm, lean, and meaty texture, and are quite delicious! And to actually answer that question: some people do feed their dogs keta salmon. But we have lots of customers who feed their dogs sockeye and king salmon! We do love to take good care of our pets, here in Seattle. How should I cook Keta salmon? 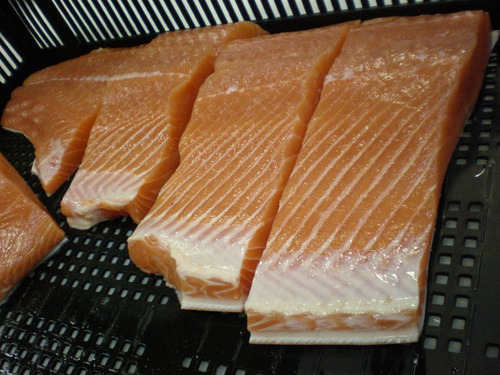 Keta salmon have a lower oil content, which gives them a firm texture, mild flavor, and thick flake size. For this reason, they are great for marinades or special seasonings, as the fish will soak up the flavors you pair it with. However, you want to be very careful not to overcook the fillets. Since it has less oil, it takes much less time to cook. Our partners, I Love Blue Sea, say they love to use keta salmon in fishermen pies and potpies, or sautéed with capers and white wine vinegar. Many of our customers use them for seafood stews, salmon patties, and pasta sauces. Check out Loki Fish Company on Pinterest for more recipe ideas! Beautiful keta fillets, ready for cooking! I’m ready to become a Keta convert. (Or I already love it and want more!) When and where can I get the fresh stuff? Our two boats, the Loki and the Njord head out in Puget Sound on October 19, so you can expect the fresh keta at the local farmers markets starting the following week and lasting 3-4 weeks! Come see us and taste this year’s fresh Puget Sound Keta! CSF Now Live for Local Customers!